Thank you. I have been struggling soft gamine represented by peter pan collars when I am 60 years of age. I have always been a soft gamine. Shopping has always been a trial as well meaning sales staff and friends try to talk me into “childlike” designs and shapes. I like being a force to be reckoned with, and I have not been childlike in my mind for many, many years! I think it’s so important with all of these types to forget how other people tend to portray them and just look at the silhouettes and recommendations. You can do something that fits in the SG guidelines that is witty and fun without wearing styles that you might have worn in kindergarten. Some girls do look cute with the peter pan collars and the little straw hats, but it’s certainly not for every SG. A Gamine type certainly sounds possible from those answers, but I think the best way to figure it out is to try stuff on. There seems to be an odd connection between FG and TR I don’t really understand, myself. I have seen people on Facebook tell someone they’re either FG or TR and I’m like “Huh?” because to me the two types are sooo different. So, if I wear TR lines I have to enhance them with brave, oversized, funny and contemporary accessories. I have also to be careful as many of stereotypical TR cuts are too overly feminine for me. And when I’m wearing FG lines, I have to add more intricate details, more delicate accessories and ornaments. I have to avoid very sharp, obvious lines especially near my face. Hmm, I don’t know. If neither TR or FG fit exactly–if TR’s cuts are too feminine and FG’s are too sharp–I might go somewhere else entirely. Straight G? SN? You may be a Soft Dramatic. A and D is pretty close to A and E, which is the Soft Dramatic. You can read the description and try on some clothing. It may work on you. Actually doing clothing try-ons is the wrong approach, since clothing doesn’t have a type and everything depends on the head-to-toe outfit. I would instead ask whether the yin/yang position of Soft Dramatic sounds right to you. This is why Kibbe no longer recommends doing the quiz–it puts the focus on breaking you into parts, rather than your yin/yang balance as a whole. Generally I say to avoid Pinterest or Polyvore, because even when they’re accurate representations of a style, they’re still someone else’s vision, and it gets stuck in your head and makes it harder for you to forge your own path. If I were trying to figure out why there are so many straight lines/geometric shapes in that pin, I’d say it’s because it’s a representation of a Bright Winter interpretation of TR, and Bright Winter coloring lends itself to geometrics and bold contrast. So you have some of these elements in a BW of any Kibbe, even TR. The idea is that it won’t read as particular straight or geometric on a TR, just normal. TR doesn’t do casual in the traditional sense, just like FG doesn’t do glamour particularly well. Jeans and a t-shirt and sneakers aren’t going to work for you TRs. You need something a little more special. I agree that Soft Gamine and Ingenue are not the same. I tried for years to fit into other systems’ categories but never fit before I found Kibbe’s soft gamine. It accounted for my being somewhat lush and full bodied, delicate, sharply dramatic, and having the face of an elf, all at the same time. Ingenue really wasn’t much help in accounting for all of those. 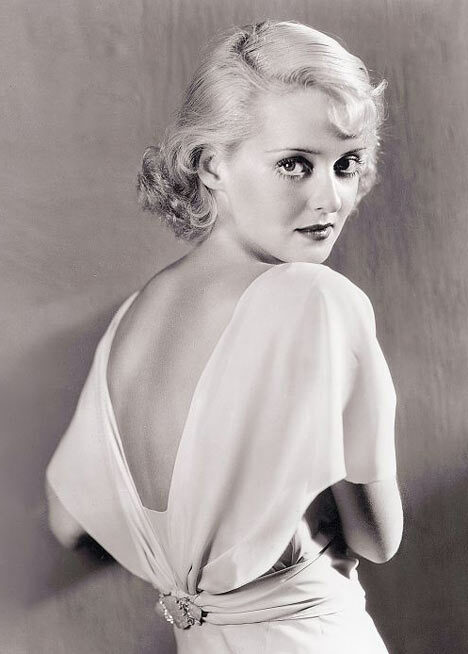 I like this picture of Bette Davis too for showing her wearing some of the SG recs that flatter me: she’s wearing soft, curving lines in her hair and clothing. they look somewhat lush and delicate, but the lines all have clear boundaries and look compact. That’s my understanding of a difference between SG and R. I look good in crushed velvet and ruffles, but there needs to be compact lines and clear boundaries(gamine influence) for it to work. I remember in his examples in the book both the SG and the R were wearing fitted, red dresses with ruching. But the SG dress was made of compact, sharp fitted curves out of matte fabric and the romantics dress had more lush extravagant curves out of shiny fabric. Ive lost my copy of Kibbe’s book so I dont remember what its called but I remember a section for telling the difference between types that have a lot in common. The two types he compared with SG were R and TR. He gives recs for those last two types for attractive women regardless of age. I don’t see why it should be different for SG. Definitely. SG is not about looking like a little girl; it’s about the lines. I remember that ingenues we supposed to mature into romantics or classics, and gamines supposed to mature into naturals or dramatics. Seniors can dress more delicately; this really only applied to adults in their prime, not all of adulthood. 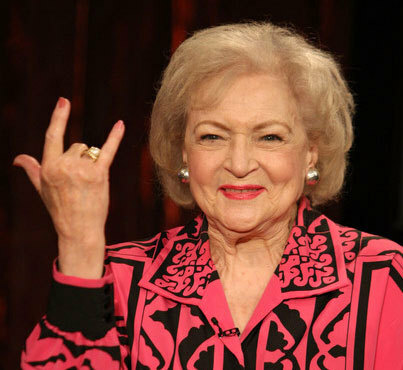 Kitchener categorizes Betty White as equal parts ingenue and gamine. Since the McJimsey categories can be mixed, and Kitchener says nearly everyone is some kind of mixture, if Ingenue is too childlike you can draw on the other part of your mixture. The Kibbe Romantic and McJimsey Romantic are also quite different. I score high in the Kibbe Romantic, but not at all in the McJimsey Romantic (I score high in Ingenue instead). The Kibbe Romantic is a mixture of the McJimsey Romantic and Ingenue. It’s soft and curvy but not necessarily sexual. The McJimsey Romantic is more alluring and mature. Marilyn Monroe is pure Romantic in Kibbe, but in McJimsey she’s equal parts Romantic and Ingenue. I’m not a fan of Kitchener’s work at all, so I’m not going to let it change my point of view that he sees her as half ingenue, lol. Kibbe rejects Ingenue outright. There is no place for it in his system at all. So…yet another system that I have no place in? What if Ingenue just slightly outweighs Classic? Sure, I am only 5’1″. I am not,”Gamine”. No “A” answers. Only two for “E”. All the rest are “C” & “D”. D isn’t ingenue. It’s just a less extreme yin. The first point I’d like to make is that a lot of women see themselves as either more moderate than they are, more yin than they are, or both. So I would try to really look at yourself and consider whether you have any elongation, how wide your bones/frame is, etc. I would not concentrate that much on the quiz and look at your yin/yang balance and overall impression. What do you see in the mirror from 12 feet away? The second is that if you find that the clothing listed under “ingenue” in other systems is what works for you, in Kibbe, you’d likely be Romantic or Theatrical Romantic, depending on your frame size. Since Soft Gamine is nearly half yang, they can’t really go as yin as ingenue. Rs and TRs can, depending on the individual, and if you’re petite in bone structure as well as height with a bit of sharpness, you’d go for TR, and your petiteness is limited to height and your bone structure is soft and wide, go for R. As far as SC goes, 5’1″ isn’t really a moderate height, so you’d really need to give off a balanced, moderate impression to be C above everything else. Hi how are you? I’ve been having some trouble with my kibbe test. The predominant of my answers comes from d with a secondary force on E and some Cs. I can’t figure out what time am I. Thank you! I’m trying to understand myself aswell the test. I feel that maybe it has a gap on the method, but it stills fabulous. I really want to study and go into it. What about trying the Personal Style Counselors’ system as developed by John Kitchener? They have 2 extra styles (which they dub “essences”): Ingenue and Angelic. They call Gamine “High-Spirited” and consider it separate from Ingenue. Angelic is considered to be yin but it’s long and lean like Dramatic. There are good descriptions as well as a quiz available via Truth is Beauty blog who use Kitchener’s/PSC’s system. In that system you can have up to 3 essences expressed though you may have a tiny fraction of several others. I was struggling with the D’s in the Kibbe system & also had a mix but not like Kibbe describes but the closest fits were Soft Gamine & Classic. I had an equal mix of D, E & C plus a few B & A. But on PSC/Kitchener quiz I came out equal mix on the quiz of Classic, Ingenue, and Romantic (90% total) – not sure what the rest was. I don’t care for Kitchener (or Truth Is Beauty), which is why I don’t discuss them on this site.